Celebrate your love with this beautiful bridal set from Perfect Fit. 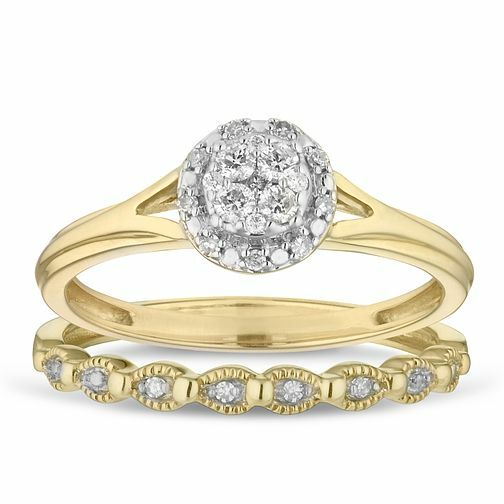 Crafted from gorgeous 9ct yellow gold, this set features an engagement ring with a captivating round cluster of diamonds upon cut-out shoulders. This set is complete with a diamond set wedding band with marquise frames adorned with milgrain details. This set is shaped to sit together in perfect harmony, for an elegant and timeless way to celebrate your love. The total diamond weight of this bridal set is 0.15ct.